‘The Killing of Alan Turing’ looks at the questions that surround Turing’s death, and asks why the coroner’s conclusions do not square with the facts. On the morning of 8 June, 1954, the body of Alan Turing was discovered by his housekeeper. There was a bottle of potassium cyanide in the room, and an apple, from which a few bites had been taken, on the table beside the bed. The coroner ruled suicide, and it was assumed that the apple had been dipped in a cyanide solution. Turing’s mother did not accept this, and concluded that it must have been an accident. She supposed that her careless son had transferred cyanide from his hands to the apple while carrying out an experiment. At any rate, as anyone who had spent time with Turing knew, he was fond of repeating the couplet spoken by the Wicked Witch in Snow White and the Seven Dwarves. Turing was a man whose career had been undermined by his conviction for “gross indecency” in 1952. He spent the following year being “treated” for his homosexuality with synthetic oestrogen, which slowed his mind and caused him to grow breasts. That he would commit suicide was entirely feasible. There was, consequently, no further investigation because the conclusions at the inquest seemed obvious. Yet the assumptions, and the conclusions, did not entirely fit with the facts. The trouble was that, at the time, so many of the relevant facts were not known. 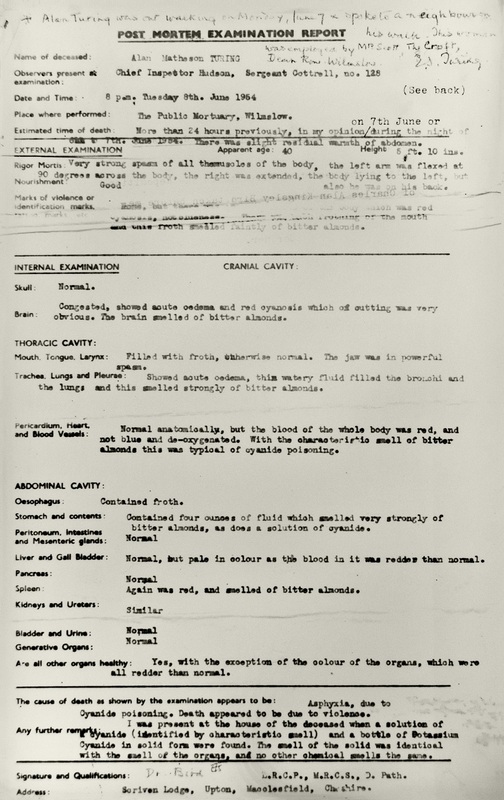 The coroner’s report details that Turing had ingested “four ounces of fluid which smelled very strongly of bitter almonds, as does a solution of cyanide”. The brain was “congested”, and like the blood, “smelled strongly of bitter almonds”. The cause of death was ruled “Asphyxia, due to Cyanide poisoning. Death appeared to be due to violence.” A solution of cyanide was found at the scene, along with Potassium Cyanide in solid form. “The smell of the solid was identical with the smell of the organs, and no other chemical smells the same.” In other words, this was not an accident that resulted from a careless handling of an apple. This was a case of deliberate poisoning. The conclusion that Turing had committed suicide came as a genuine shock to the people who knew him. There was no warning, and there was no suicide note to make sense of it. At dinner with friends a matter of days before he seemed his typical self; he had left work as usual on the Friday, and had booked a session on the computer the following Tuesday. In his room there were theatre tickets for later in the month, as well as a letter of acceptance, as yet to be posted, to a Royal Society function on June 24. The trial was two years in the past, and the organo-therapy had come to an end in April 1953. As his biographer Andrew Hodges notes, “he seemed to have risen above it all”. Yet what other conclusions can be reasonably drawn? In the early years of the 1950s, the political establishment was alert to the possibility of espionage in a way that it had not been before the start of the Cold War. In his book Society and the Homosexual (1952), the sociologist Gordon Westwood described homosexuality as a mental illness as well as a social danger. There was, as Westwood saw it, a conspiracy of homosexual men bound together in a tight-knit social structure that, precisely because it was secret, meant its members were prey to blackmail. In the United States, homosexuality was recast as a threat to national security. The Americans pressured the British to purge known homosexuals from the ranks. Commander E.A. Cole of Scotland Yard spent three months in 1953, in fact, being coached by the FBI about the security risks from homosexuals, who assumed to be morally weak and therefore open to blackmail. Alan Turing was at the centre of a web of state secrets, both British and American, and it reached to the highest levels. In 1943, on the back of his work breaking the Enigma codes, he had been the top-level liaison between Britain and the US. As Andrew Hodges points out, “he knew how the system worked as a whole – the people, the places, the methods, the equipment”. And in the end, “his field of expertise was even more closely guarded than that of nuclear weapons”. What Turing knew about computer methods in the post-war years meant that he was “at the frontier of knowledge”, and unlike nuclear physics, the very existence of this knowledge was secret. Turing knew far, far more than the spies Guy Burgess and Donald Maclean, who defected in 1951. 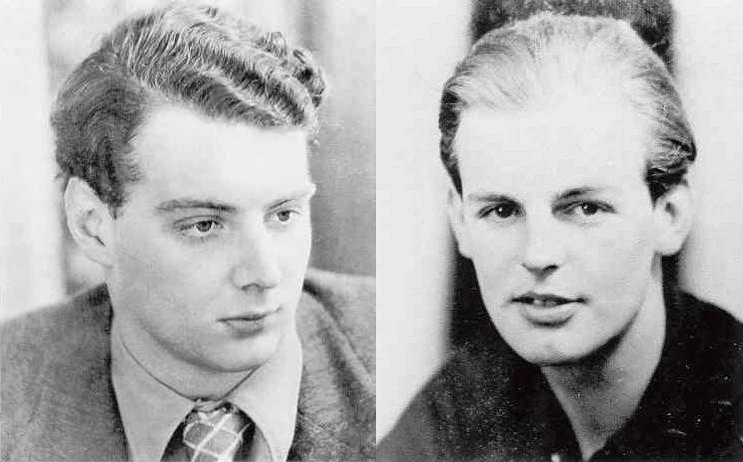 Burgess and Maclean were only assumed to be gay, but Turing had been found out and convicted. He did not make a secret of his homosexuality, and he was insistent that friends and colleagues accept this. He travelled in Europe in 1952 and 1953, to places where homosexuality was not illegal, in a deliberate act of defiance. He proved unpredictable. The maverick whose unconventional mind had worked for the government throughout the war was, as they saw it, could now be working against them. He was placed under constant surveillance. There was even an incident in March 1953 when a Norwegian friend Turing had invited to visit was prevented from making contact with him, and ended up leaving the country when no meeting with Turing could take place. At the time of his death, Alan Turing was a potential problem for the British government, and a highly dangerous one at that. If a nuclear physicist had been found in such a manner, the circumstances would have been treated as suspicious. But there was no reason to suspect foul play. There was no cover up because no one was asking questions. The significance of Turing’s work, and his position on the political chessboard, was hidden under a veil of secrecy. It is not unreasonable to see the suicide of Alan Turing as an event that was staged, with the apple and the cyanide solution as the ideal props. Looking at the facts as a whole, this is the explanation that makes the greatest sense. It fits the facts in a way that the other conclusions do not. There is of course no “smoking gun”, no irrefutable proof, but history is as much about detective work as it is about facts; it is a selection process, and that process requires an imagination to deduce all the possible connections. In the end, whether Alan Turing was poisoned or whether he committed suicide, it was the British political establishment that killed him. There is nothing in the facts to contradict that conclusion.